Wadi Al-Salaam (Valley of Peace) is an Islamic cemetery, located in the Shia holy city of Najaf, Iraq. 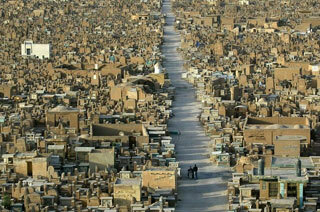 It is the largest cemetery in the world. The cemetery covers 1,485.5 acres (601.16 ha; 6.01 km2; 2.32 sq mi) and contains over 5 million bodies. It also attracts millions of pilgrims annually. This article uses material from the Wikipedia article "Wadi-us-Salaam", which is released under the Creative Commons Attribution-Share-Alike 3.0 License.